Posted By:Unknown | At:6:40 PM Be the first to comment! ATLANTA (AJC) — Police said late Friday that former NBA player Javaris Crittenton, who was once suspended by the league over guns in the locker room, has been charged with murder after a woman was shot on an Atlanta street. Police spokesman Carlos Campos said police have secured a murder warrant for the arrest of Crittenton, who played at Georgia Tech, in connection with the shooting death of 22-year-old Jullian Jones on Aug. 19. Campos said Crittenton is not in custody and is wanted. Atlanta police Maj. Keith Meadows told The Atlanta Journal-Constitution on Friday night that Crittenton is believed to be in the Los Angeles area. He said the FBI is involved in the investigation. Jones, a mother of four, was walking with a group of people on the city’s southwest side when a dark-colored SUV drove by and she was shot by someone inside the vehicle, police said. Investigators say they don’t believe the woman was the intended target. Campos said the motive appears to be retaliation for a robbery in April, in which Crittenton was a victim, Campos said in a statement. Messages left for an agent who has represented Crittenton were not immediately returned Friday night. 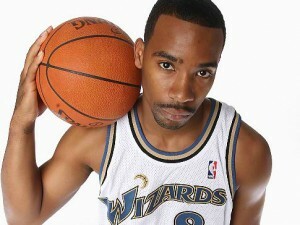 Crittenton most recently played in the NBA with the Washington Wizards and was involved in a gun altercation with Gilbert Arenas. He is on the roster of the NBDL’s Dakota Wizards. Crittenton didn’t play last season because of an ankle injury. He was given a 38-game suspension by the NBA after he and Arenas acknowledged bringing guns into the locker room following a dispute stemming from a card game on a team flight. Crittenton pleaded guilty to a misdemeanor gun charge on Jan. 25, 2010 and received probation. He wasn’t re-signed by the Wizards. The Charlotte Bobcats signed Crittenton to a non-guaranteed contract before last season but he was waived Oct. 15. Crittenton was the 19th overall pick by the Los Angeles Lakers in 2007. He played little with Los Angeles and was sent to Memphis in the Pau Gasol deal his rookie year. He was traded to Washington in December 2008. Crittenton averaged 5.3 points and 1.8 assists in 113 NBA games.